Cook sweet potatoes until tender and mash. Mix in all other ingredients except eggs. Add more sugar and lemon flavoring to taste. Add the eggs last. You don't want to be tasting raw eggs! 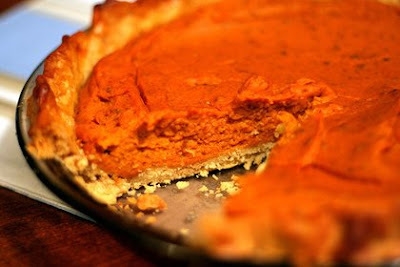 Divide the sweet potato mixture into the 2 pie shells. Bake at 350 degrees until brown (as you like). Hope this helps - wish you could post a sound file of her telling me this recipe to your blog. It was great!! Took about 15 minutes....(Let me get this frog out of my throat.) These are the absolute hardest recipes to put into words. Imagine all that cookin' knowledge she has!! !